Successfully Added Executive GSM Business Desk Phone - EU Edition to your Shopping Cart. NOTE: This product is compatible with the worldwide standard GSM frequencies of 900MHz and 1800MHz that are primarily used in the EU and other regions. Please check with your local provider if you are unsure of your local band requirement. THIS PHONE WILL NOT WORK IN THE U.S., CANADA, MEXICO. Please order CVFK-M14-US if you need a 850/1900MHz dual band version. 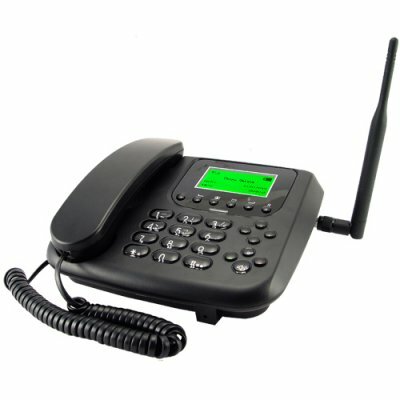 Can this GSM desk phone work in the USA? No, this GSM desk phone is only compatible with 900MHz and 1800MHz frequencies, it will not work in North America. Its great. I ordered it from the UK on the 18th of March and received on the 22nd. Its barely 2 days. The functionality is perfect and as per the specification. Sound quality is ok. Honestly the audio quality is better than the conventional GSM we use. Thanks to Chinavasion. Clear good sound in all ways! One week from order to I recive the phone, thats very fast to Norway. Thank you! I purchased this product form Chinavasion on Monday, I received on Friday. I installed a SIM card in it, charged the battery made phone calls,hands free or handset, it worked straight out of the box. I feel confident to buy from Chinavasion.